Brick LLP recently completed a 70,000 square foot building in Mountain View, Calif. that is on track to achieve LEED Platinum certification. The keystone of the project is a 13,000 square foot rooftop garden that Brick designed with landscape architect, Marcel Wilson of Bionic, and the roof – along with everything below it – is up for grabs. 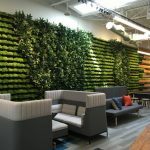 Nathan Donato-Weinstein, a real estate writer for the Silicon Valley Business Journal, has reported that Nuance Communications – who signed a 12-year lease in 2012 – has decided not to occupy the building right away and may be looking to sublease. Brick founder and principal Rob Zirkle worked with developer Dan Minkoff to design a building that would attract attention in the competitive Silicon Valley market, which will serve them well now that potential tenants may again be eying the property. In addition to the green roof, other sustainable features include low VOC products, bike storage, and a parking lot that need only accommodate 30 cars since the building is located 200 meters from the nearest Caltrain station. “All of these things led to the roof being the icing on the cake,” said Zirkle. “It’s the marketing engine for achieving LEED Platinum and looks awesome,” to boot. Because the design for the structure was planned before a tenant was named, Minkoff and Zirkle worked together to forecast how the building, including the roof garden, would be used. They designed it so that, say, the CEO would have enough space to address a large group, but they also carved out smaller “seating pods” – articulated with steps – where a few employees might take their laptops to work on a group project, or work individually. Zirkle was careful to point out that the rooftop isn’t just a pretty face, so to speak – it’s smart, too. Boston based Sasaki Associates is now at work in the interior, with completion expected this spring.